We each had one item on the RTW trip from our wish list. Mark wanted to trek with the gorillas – check! 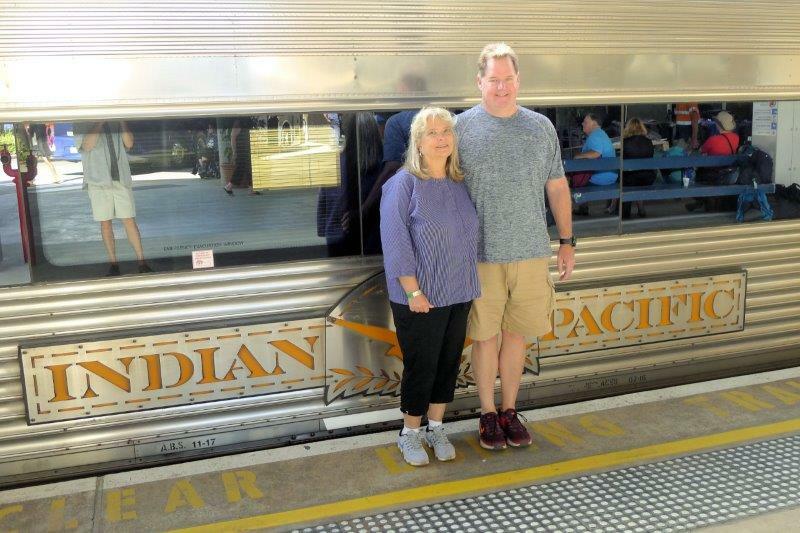 Susan’s wish list item was a bit tamer – ride the Indian Pacific train across all of Australia. We took it from Perth to Sydney – from the Indian Ocean to the Pacific Ocean for 4352 km or 2704 miles. This trip takes about 4 days and we had the fun of sleeping on the train for 3 nights. 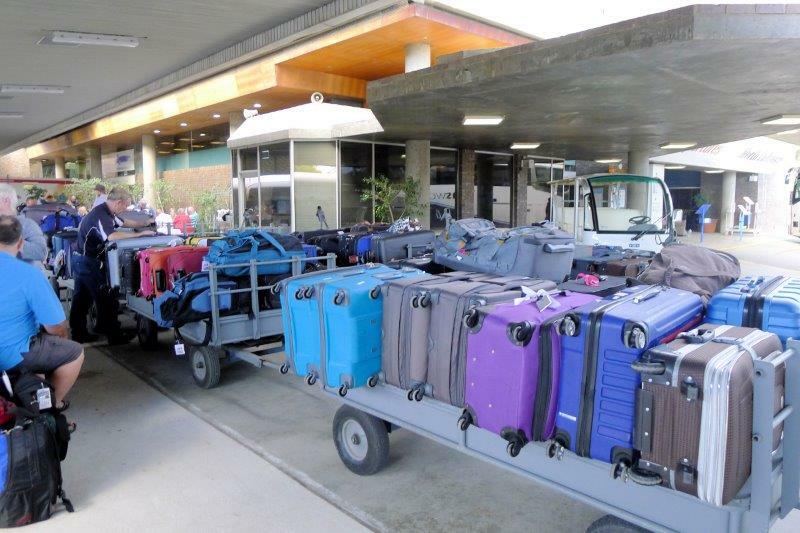 The compartments are small so all these bags went to a luggage car not to be seen for 4 days! 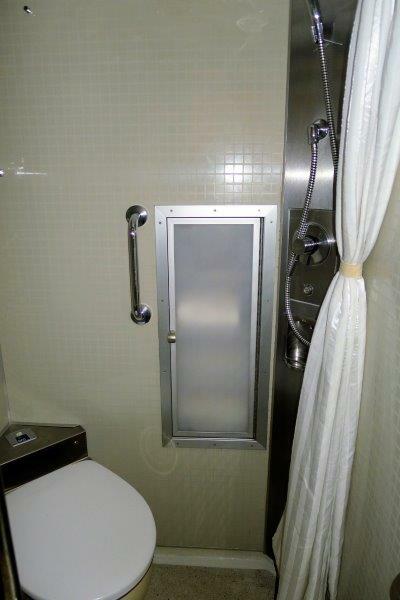 The toilet and shower compartment were very functional! Each compartment for 2 people has a little toilet room with a shower. The shower worked better than a few we encountered in hotels in India. The beds are stored during the day. 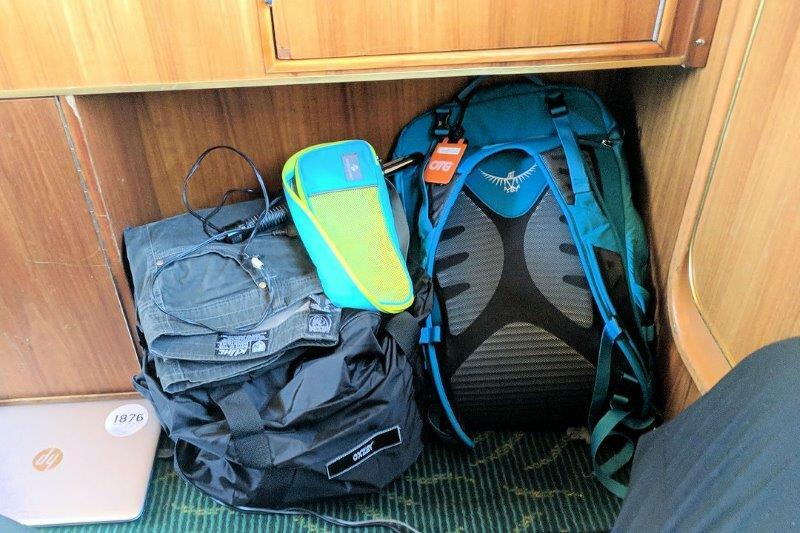 We had our backpacks and one small cloth bag for our clothes. We had to buy the cloth bag in Bangkok! Dave couldn’t wangle a visit to the engine compartment so he settled for climbing on the engine while we made a stop in Cook. When Dave Young from Fort Collins heard about the train, he invited himself along since he’s a HUGE train buff and this one is on his bucket list. 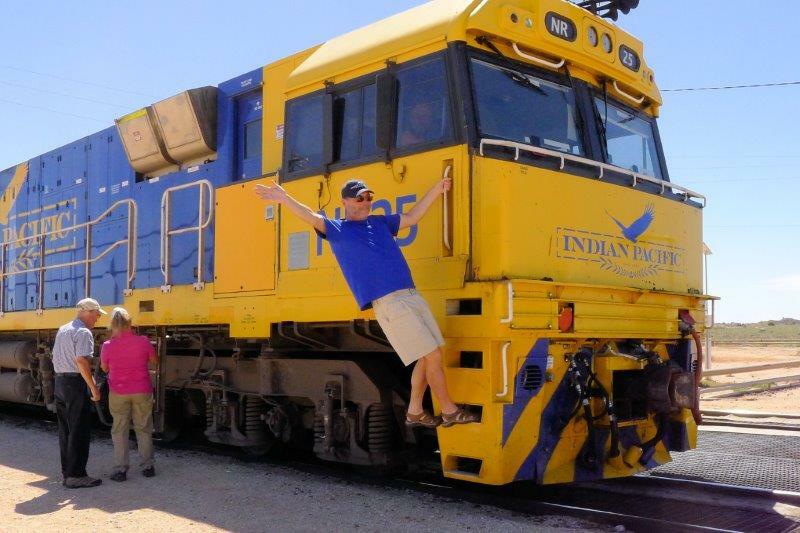 The Indian Pacific left at 10 AM Sunday morning from Perth and climbed out of the suburbs into the hills. The ticket prices include food, unlimited drinks including wine, champagne, beer, gin and tonic, coffee, soft drinks and tours at each stop. The tour part is important because our first stop along the way was at 10 PM Sunday night in Kalgoorlie, Western Australia. The tour took 2 hours on the bus and showed us where the houses of prostitution were and where the huge gold mine is. 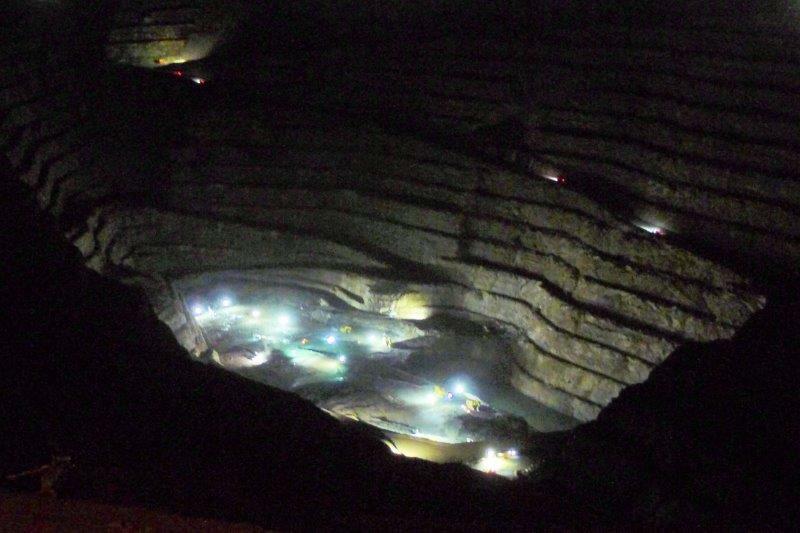 It’s a pit mine, about 1.5 kilometers deep and is worked 24 hours a day, 7 days a week. We want to come back in the daytime for a real mine tour. The Kalgorlie mine is a gold mine operating 24 hours a day 7 days a week. 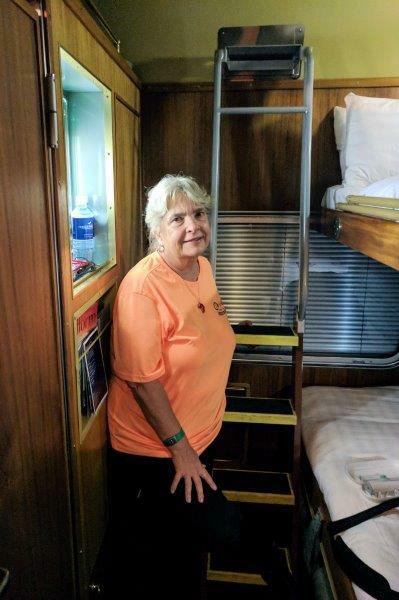 Then it was back on the train for our first night of sleep in the little bunks. Mark got the top one! Sleep was OK although at 3 AM, the tracks got a little rough! Mark’s bunk had a rail he could put up just in case he might want to roll out. Mark got to use the ladder to crawl into the top bunk. Day started with breakfast in Rawhinna about 6 AM outside on tables. 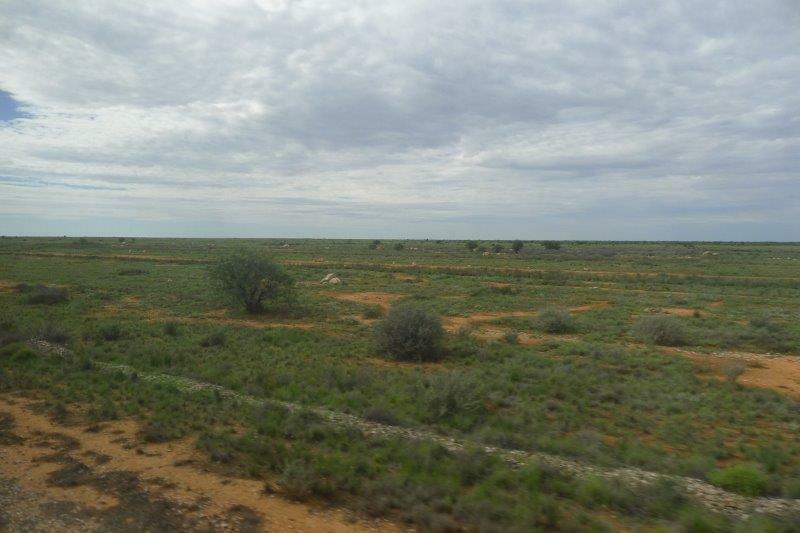 Rawhinna is on the edge of the Nullarbor Plain and is the start of 478 kilometres (297 miles) of perfectly straight rail – the longest in the world . On Day 2 we stopped at Cook for a resupply of water for the train. Cook is pretty much a ghost town after the Australian government privatized the rail. The only things there are an airstrip for emergency commercial flight landings in the middle of the country (Never used), fuel and water for trains, and overnight accommodations for freight and passenger train crews. 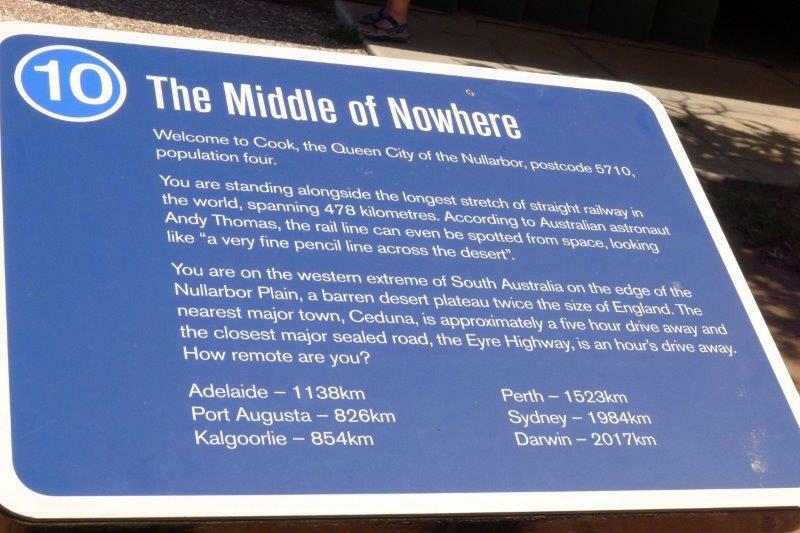 This explains exactly where Cook is in Australia – 1523 km to one coast and 1984 km. to the other coast. 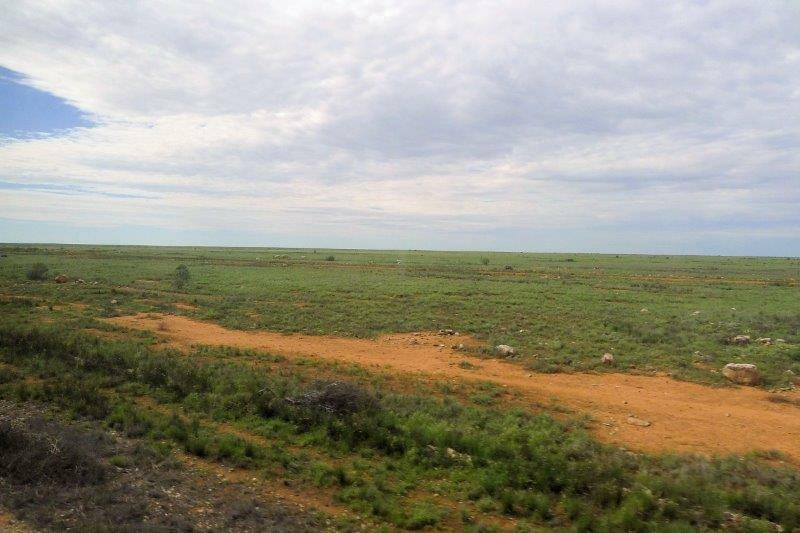 A tropical storm had just crossed Australia and the Nullarbor Plain was very green. The train stretched fro about one mile. 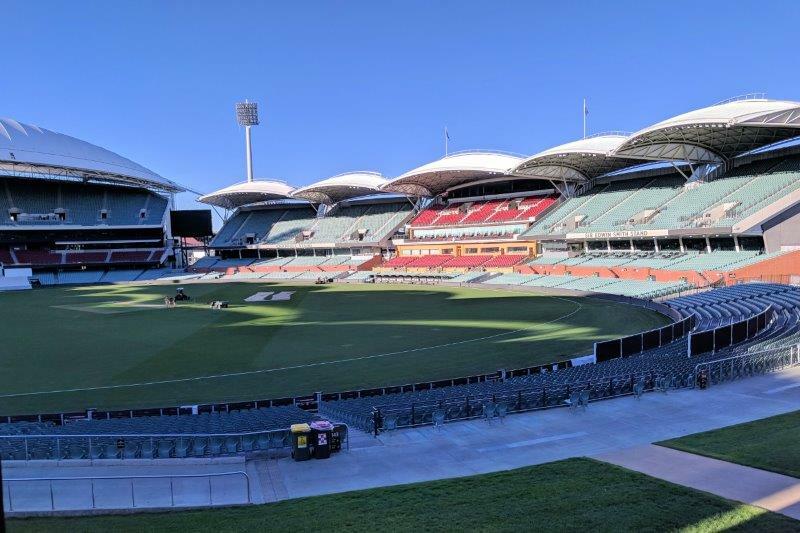 Day 3 started with Adelaide at 7:30, Mark took the tour of the Adelaide Oval – cricket and Aussie Rules and Rugby – while Susan took a bus tour of the city. Dave left us here for 5 days in Adelaide before he flew home. 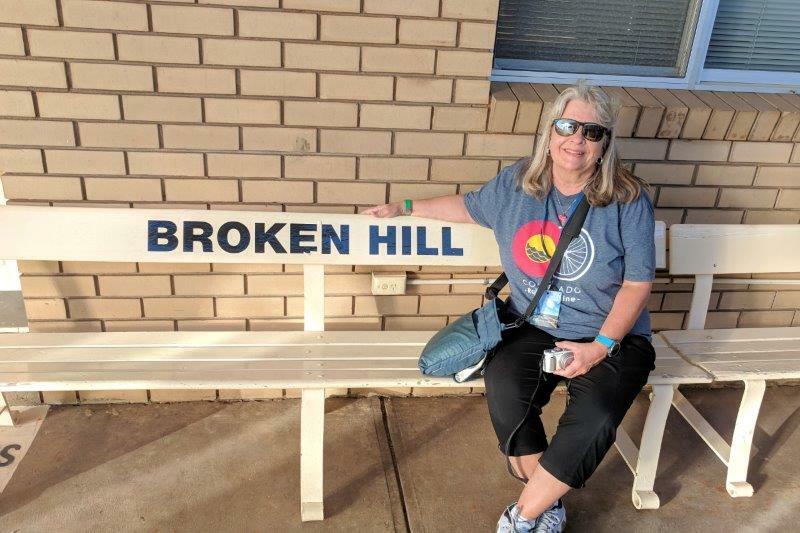 The train stopped in Broken Hill in the afternoon. 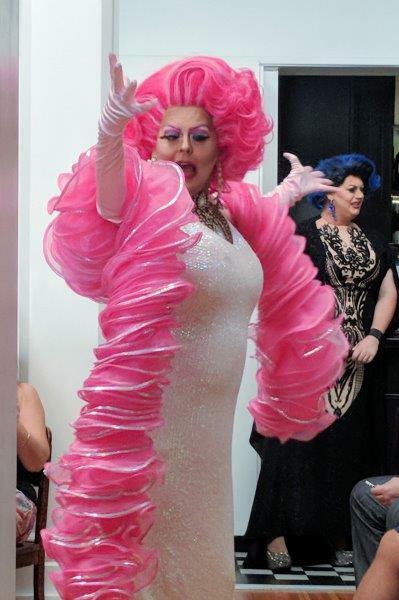 We saw the Main Drag show in the hotel that was used in “Priscilla, Queen of the Desert”. On Day 4, the train wandered its way through the Blue Mountains and suburbs of Sydney before arriving about noon at Sydney Central Station. 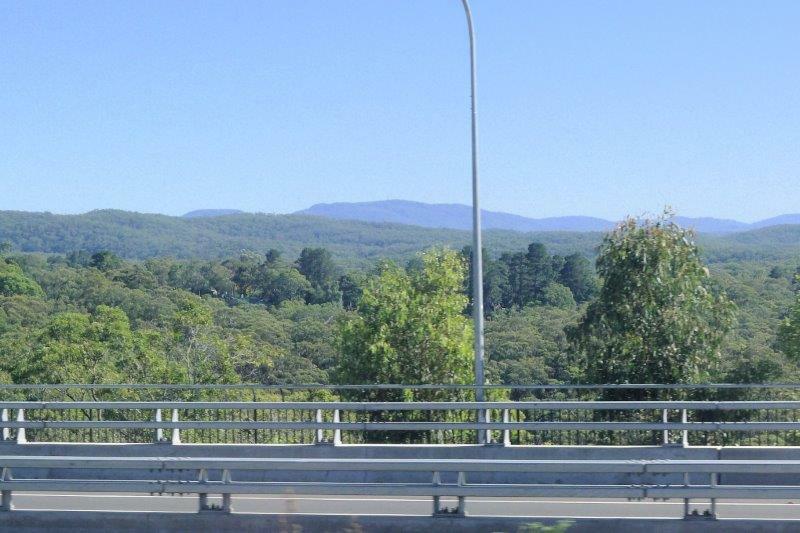 By the time we reached the Blue Mountains, we’d entered a completely new climate area. Lots of trees and from here the train wanders into Sydney. 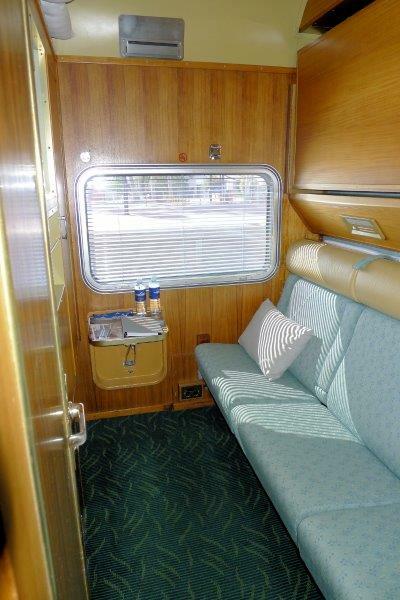 In between stops, we used our cabin for reading or naps or we wandered up to the Lounge Car and had a glass (or 2 or 3) of wine while we talked with other passengers. We met Gayle and Mark from Sydney and even got invited to their house for dinner. Another US couple we met, and there were not many of us, were from California and they’d been on a diving trip for about 2 months. We had drinks with them in Sydney. Overall, the trip was fun. There are miles and kilometers of nothing in the middle of Australia. This trip drives home the point that Australia is about the size of the US but only has about 30 million people! Lots of it are pretty uninhabitable in the middle of the desert. 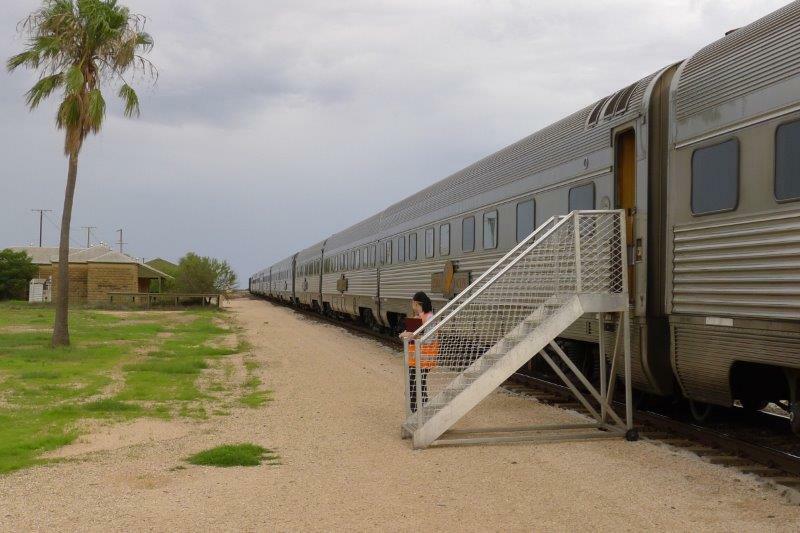 The next train trip to do in Australia is the Ghan that goes from Darwin south through Alice Springs into Adelaide. This train has been completely updated and we heard is quite posh. After the Agra tour, we hopped in the car with Sonu and headed off for our next adventure – riding a train to Ranthambore National Park. Our train was 2 hours late (no surprise!) but even waiting for the train was an adventure. 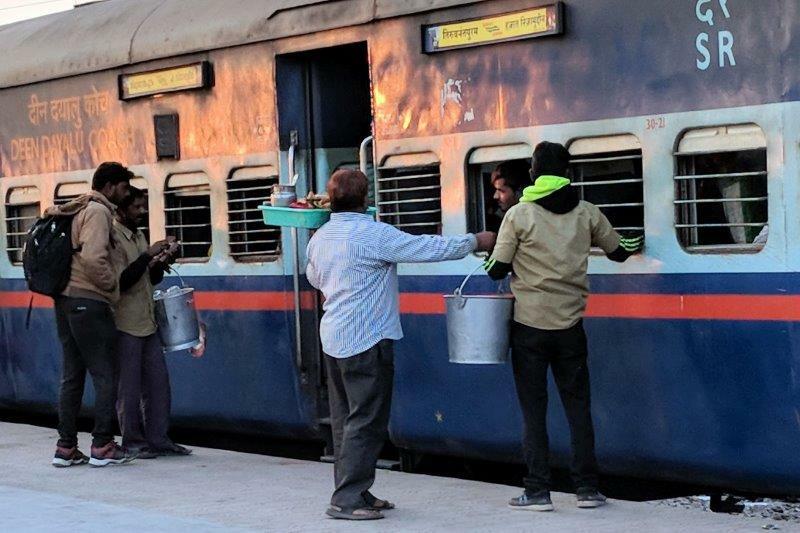 This vendor sold chai to the train passengers. 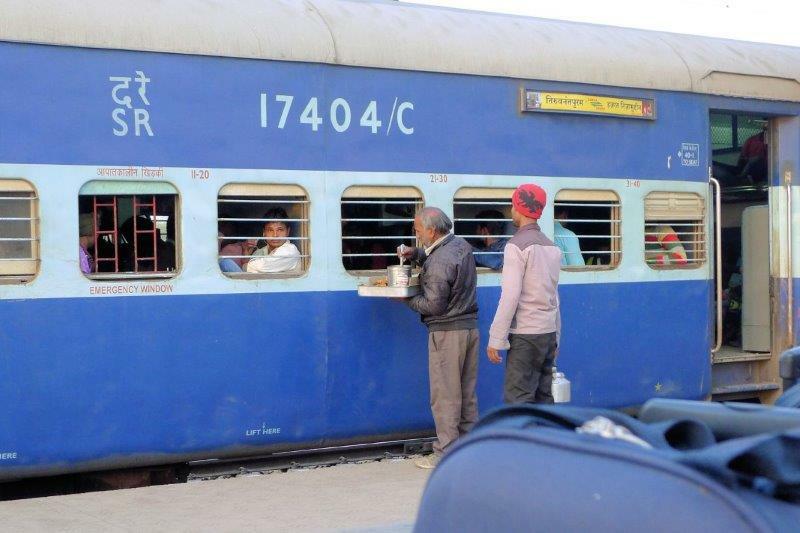 The vendors walked up and down the platform selling food through the train windows when the train stopped. These guys knew the next train would be crowded. Some of them jumped on the track to board the train through the other doors in hopes of getting a better spot. 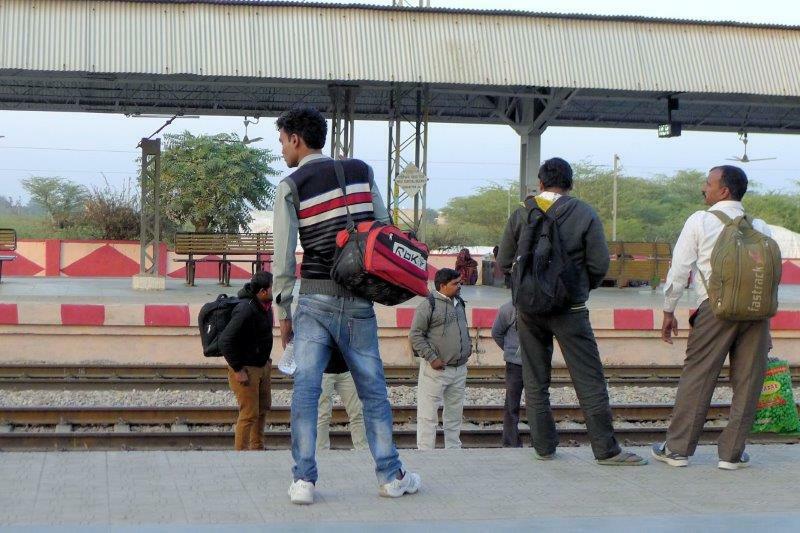 The Audley rep met us at the train station and arranged porters to take our bags to the correct track, thank heavens! The rep waited with us and another Audley couple to make sure we got on the right train and right car. While we waited, the rep wandered off every once in a while, talking to everyone he knew, giving the hawker and beggars the opportunity to swoop in and make us practice saying “no”. When the train finally showed up, the Audley rep got the train guys to put our bags up above our seats and told us not to tip until they took the bags down at the other end. That strategy worked, even though the porters grumbled, and it saved us from manhandling the bags up the steep train steps, through the crowds on the train, and then undoing everything at the end. The train was worn and old but the seats were comfortable and we all had a reserved seat. Our car’s monitor didn’t announce stops, making it somewhat of a guessing game as to where we were at any point in time. (It’s now dark so we can’t see the stop names as we come into the station.) We had our eyes on the Western tour group with an Indian guide– when they got off, so were we! Some Indian guy traveling with his family stared at the two of us for the whole 3 hour train ride! I didn’t dare take his picture! Another Audley Rep met us at the station and took us to Khem Villas who’d been alerted to our late arrival. They greeted us with hot towels, lemonade, showed us to our room (outdoor shower and tub and candles) and then fed us dinner at 10 PM.